"Sicily Island" redirects here. For the island in Italy, see Sicily. Location of Sicily Island in Catahoula Parish, Louisiana. Sicily Island is a village in Catahoula Parish, Louisiana, United States. The population was 526 at the 2010 census. Sicily Island is located in northeastern Catahoula Parish at 31°50′48″N 91°39′32″W﻿ / ﻿31.84667°N 91.65889°W﻿ / 31.84667; -91.65889 (31.846573, -91.658925). U.S. Route 425 passes through the village, leading north 23 miles (37 km) to Winnsboro and southeast 30 miles (48 km) to Natchez, Mississippi. Louisiana State Highway 8 leads southwest 11 miles (18 km) to Harrisonburg, the Catahoula Parish seat. According to the United States Census Bureau, Sicily Island has a total area of 0.58 square miles (1.49 km2), all land. In 1881, a Jewish agricultural colony was created in Sicily Island. The colony was mostly made up of immigrants from Elizavetgrad who were fleeing the pogroms that began that same year. By 1882, the colony was completely disbanded as the Mississippi River flooded, destroying most farms. As of the census of 2000, there were 453 people, 197 households, and 110 families residing in the village. The population density was 790.4 inhabitants per square mile (306.8/km²). There were 245 housing units at an average density of 427.5 per square mile (166.0/km²). The racial makeup of the village was 44.81% White, 54.53% African American, 0.22% from other races, and 0.44% from two or more races. Hispanic or Latino of any race were 0.88% of the population. There were 197 households out of which 27.4% had children under the age of 18 living with them, 34.0% were married couples living together, 19.8% had a female householder with no husband present, and 43.7% were non-families. 41.1% of all households were made up of individuals and 21.3% had someone living alone who was 65 years of age or older. The average household size was 2.30 and the average family size was 3.23. In the village, the population was spread out with 30.0% under the age of 18, 7.1% from 18 to 24, 26.5% from 25 to 44, 20.3% from 45 to 64, and 16.1% who were 65 years of age or older. The median age was 36 years. For every 100 females, there were 81.9 males. For every 100 females age 18 and over, there were 82.2 males. The median income for a household in the village was $14,783, and the median income for a family was $23,036. Males had a median income of $25,750 versus $14,821 for females. The per capita income for the village was $11,972. About 45.5% of families and 47.1% of the population were below the poverty line, including 61.6% of those under age 18 and 12.1% of those age 65 or over. Cecil R. Blair, Louisiana State Senator from Rapides Parish, grew up in Sicily Island and graduated from Sicily Island High School in 1934. S. S. DeWitt, member of the Louisiana House from 1964-1972 from Tensas Parish, was born in Sicily Island and graduated from Sicily Island High School in 1931. J.C. "Sonny" Gilbert, cotton planter, former member of both the Louisiana House of Representatives (1972–1976) and the Louisiana State Senate (1960–1972), and former director of Louisiana Department of Wildlife and Fisheries, resided in Sicily Island until his death in 2014. Lamonte Cotton [[team member of the football program]he was one the best players that ever came to Sicily Island,La. Lamonte won overall MVP his senior year. 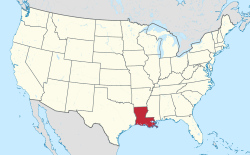 ^ "Election Returns: Catahoula Parish". Louisiana Secretary of State. November 6, 2018. Retrieved November 9, 2018. ^ Former Sicily Island Mayor Margie Price is listed among the state and local officials who endorsed the reelection in 2014 of Democrat U.S. Senator Mary Landrieu. ^ a b "Geographic Identifiers: 2010 Demographic Profile Data (G001): Sicily Island village, Louisiana". U.S. Census Bureau, American Factfinder. Retrieved August 20, 2014. Wikimedia Commons has media related to Sicily Island, Louisiana. This page was last edited on 24 February 2019, at 00:53 (UTC).